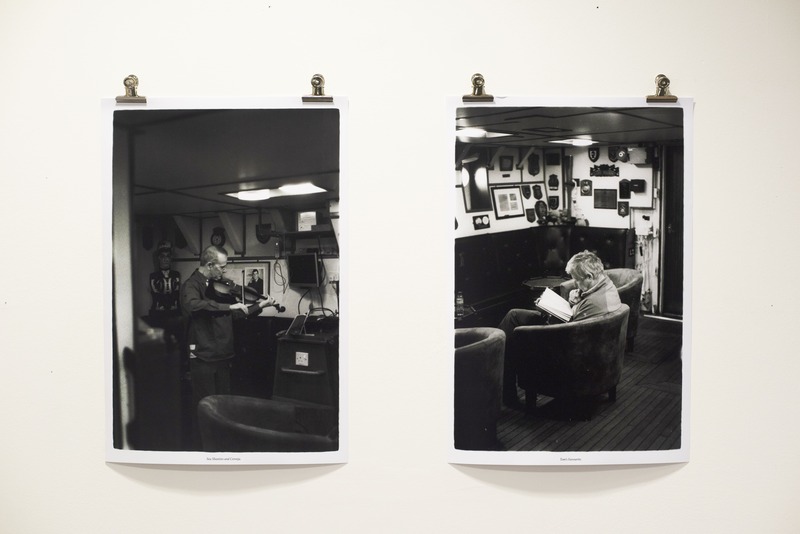 Joel applied for and was selected to run his own exhibition at the Student Union space at Central Saint Martins. From the 24th October to the 1st November I had the opportunity to exhibit a photographic project of mine in the CSM SU Exhibition & Project Space. It was the first time I had ever publicly exhibited any of my work like this, and the first time I had ever organised an exhibition by myself at all. The project was called ‘The Great Leveller’. The Jubilee Sailing Trust is a disability charity, promoting integration through the challenge and adventure of tall ship sailing. Their two tallships can accommodate many types of disabilities from wheelchair users to the blind. 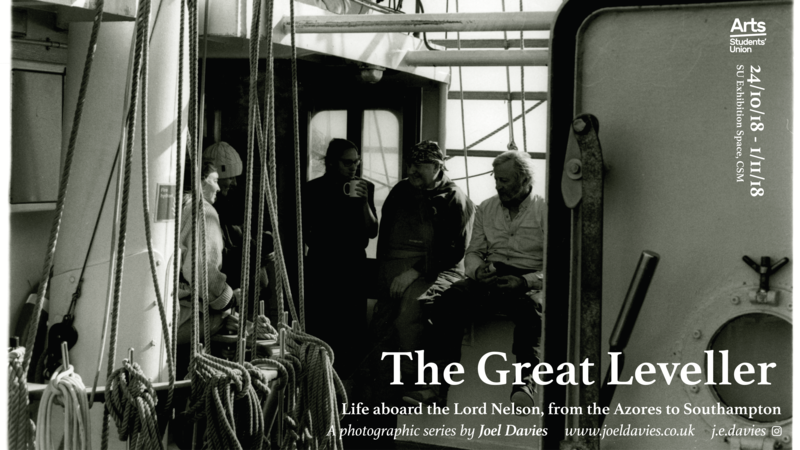 In April 2018 I had the fortune of being able to sail upon a tallship called The Lord Nelson as part of the Jubilee Sailing Trust from the Azores to Southampton. A journey of over one thousand miles sailing, with over two weeks without land. I loved it. My experience was incredible and throughout my adventure I decided to try and capture what it was that made this charity so special and the people revolving around it. From the 35mm film I shot on the trip, I processed, printed and curated a series of photos documenting this time. I heard about the opportunity to apply for this space through an SU Staff member, then also seeing the application page on the SU website. I had never applied for anything like this before but thought it a great way to gain experience with my photographic work, and so I decided to apply. It was a thorough but straightforward application which actually made me understand better what was needed to be thought through to create an exhibition. A few days after the application page closed I discovered I had been selected! 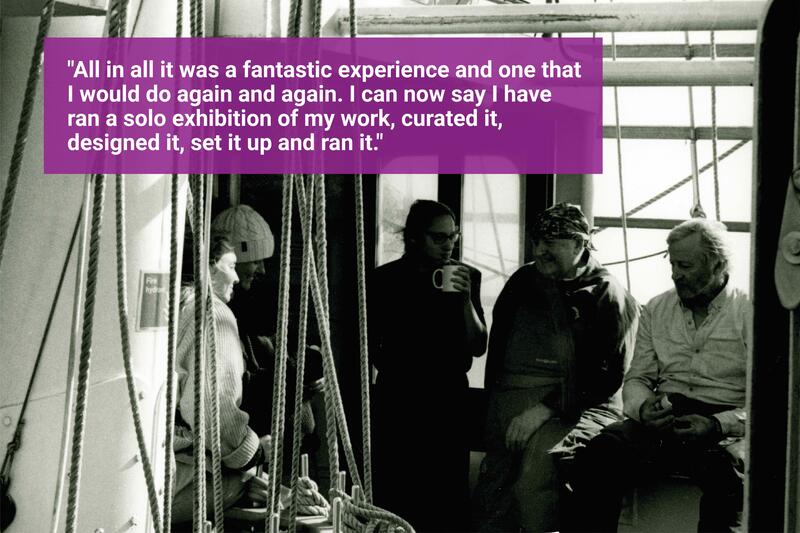 After being chosen, I was then introduced to the space properly with the SU and talked through what was needed and given support and advice with risk assessments and the nitty gritty of exhibitions. That in itself was a huge learning curve for me and is something I will take forward with me into my career. On top of that, I then had the experience of setting up and running my exhibition, having a private view and sharing my work with family, friends and other students. As my project revolved around a charity I even decided to run a fundraising page with the exhibition and to use it as an awareness campaign hand-in-hand with the charity. The private view went really well and I had the pleasure of seeing people enjoy my work for the first time. All in all it was a fantastic experience and one that I would do again and again. I can now say I have ran a solo exhibition of my work, curated it, designed it, set it up and ran it. It was not only a huge help for my future work and career but was also very rewarding as peers and tutors got to see my photos and give their praise during that time, all whilst raising money for a great charity. If you think you have something you could exhibit and apply with, then do it! It is something you will not regret.